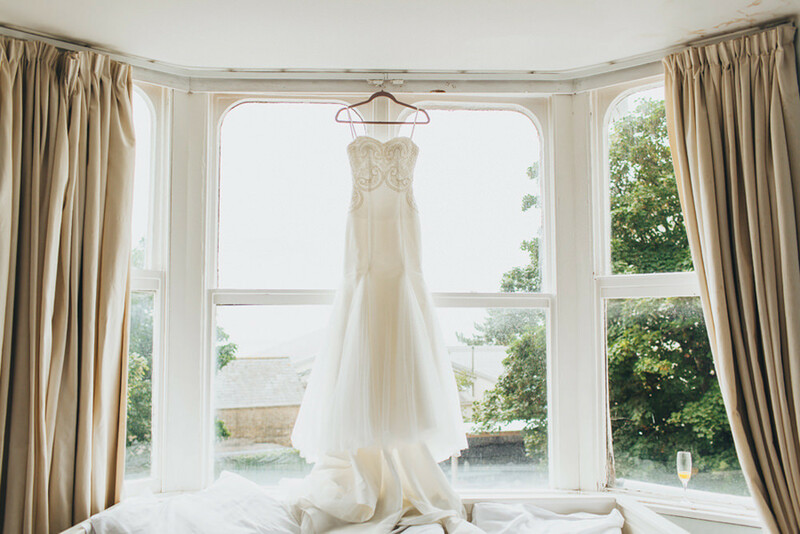 Patricia The Bride: I tried on soooooo many dresses in many bridal shops and nothing felt right. I always heard from others that once you try on THE dress, you know it’s the one! I didn’t get that feeling at all. I decided then to look to have one made. I met with local dress makers but was still unsure. After lots of online research I found Rae – she is based in Hertfordshire – 3 hours from home! I knew this would be the right choice as Rae specialises in designer style dresses as a very reasonable price. She carries out such intricate detailing and bead work and had many backless dresses to show me which was exactly what I wanted. Rae also made the veil to specification and included this in the dress price. The hair accessory was originally a necklace bought on eBay (I do enjoy getting value for money 🙂 ) I added silver claw grips to either end and it turned exactly as I had imagined. My hair and make up ladies were amazing and did my bridesmaids too. They ensured a really modern look and did exactly what each bridesmaid asked for 🙂 I would highly recommend them! Ben’s shoes were from Hugo Boss. Ben and all the groomsmen were in the same suit from Next. We decided it would be much nicer to buy instead of rent and the suits in Next are nice and affordable. Ben wanted to keep it simple and the boys wore trousers and waistcoat only. He had a 3 piece to be different and wore the jacket for the ceremony and photos. We opted for a light grey colour as we decided not to have a additional wedding colour and this matched the bridesmaids dresses. Ben was keen for a modern fitting suit. The Next suits have a range of fits in the same style which meant he could pick skinny fit and the dads and uncles could go for slim or regular fit. The younger boys suits were also from Next which was perfect. 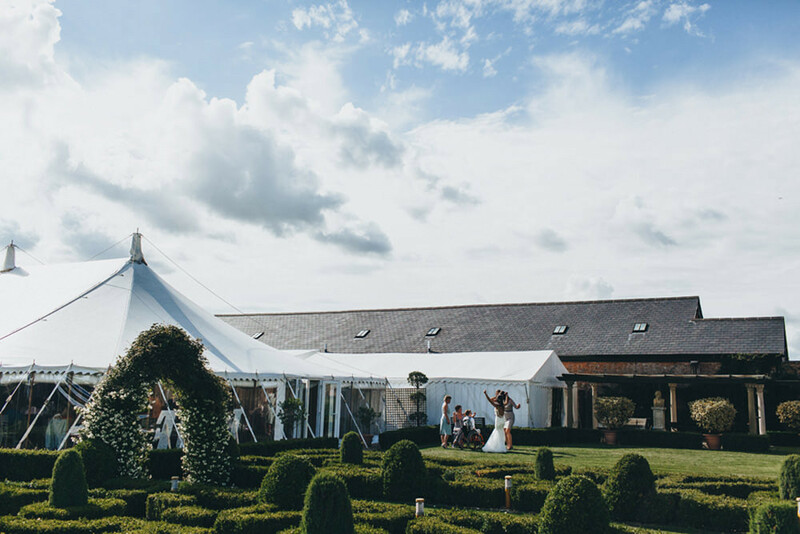 We love Parley Manor and are so glad we held our special day there. I had seen photos a few years ago (before being engaged) and I knew it was just right for us! A couple of years after that we attended a school friends wedding there and we knew then that it was perfect. Parley has the most beautiful garden grounds. The ceremony is held at the bottom corner of one side with drinks on the lawn after. The sit down and evening is held in another garden area on the other side of a bricked wall with a purpose built marque (the ceiling is full of such pretty twinkly lights!) The whole venue has a real secret garden feel to it and there is something new to look at around every corner. Zara at Parley was amazing from start to finish and was always on hand to answer questions! They were faultless! 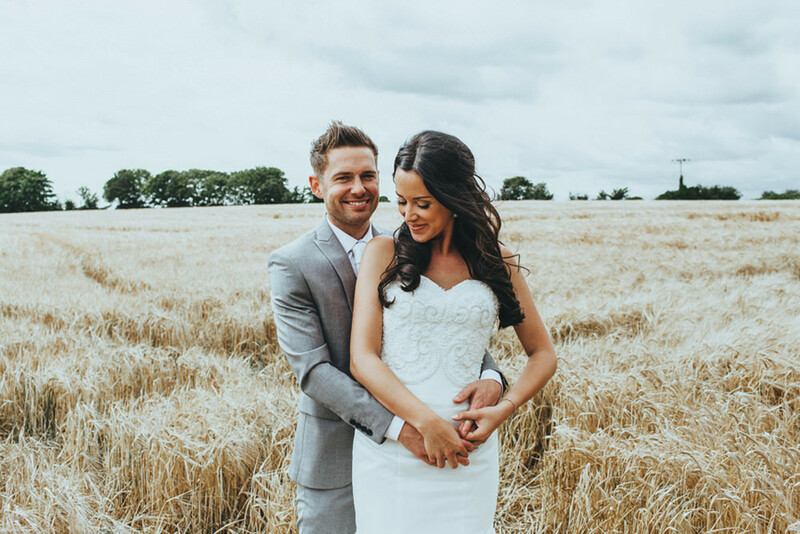 We didn’t feel we wanted a set colour so kept it plain with the pale grey/silver suits and bridesmaids dresses. Flowers were white to match the dress. We wanted a rustic theme which had a touch of glamour. 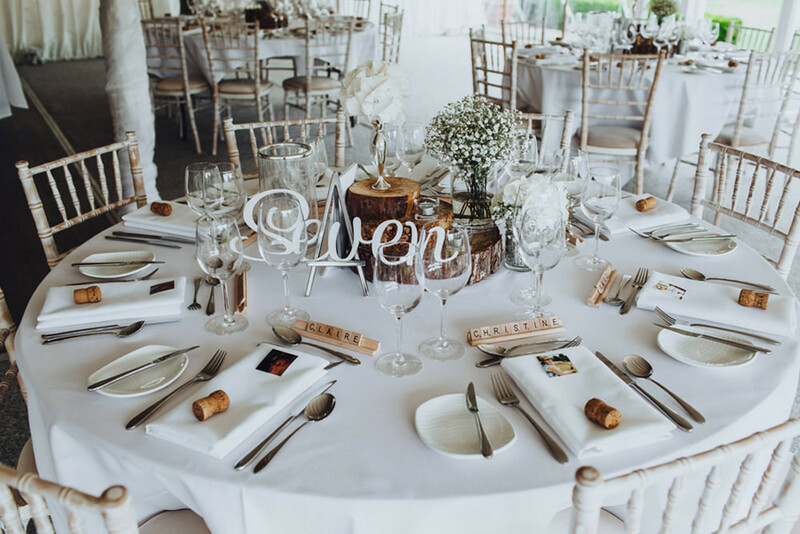 Table centre pieces were stacked tree trunks and we had lots of additional wooden touches – the table number and scrabble letters for each place name. We counteracted the rustic bits with white pieces such as ornate frames and the 5 foot free standing wooden light up LOVE letters which Ben made. We also had a few chalkboard style signs which Ben made from mdf sheets with chalk paint, and he drew all the wording freehand. Maria from Simply Flower was super helpful from start to finish. She understood the look we wanted and helped us achieve this within budget. The bouquets were very white hydrangeas which I loved! 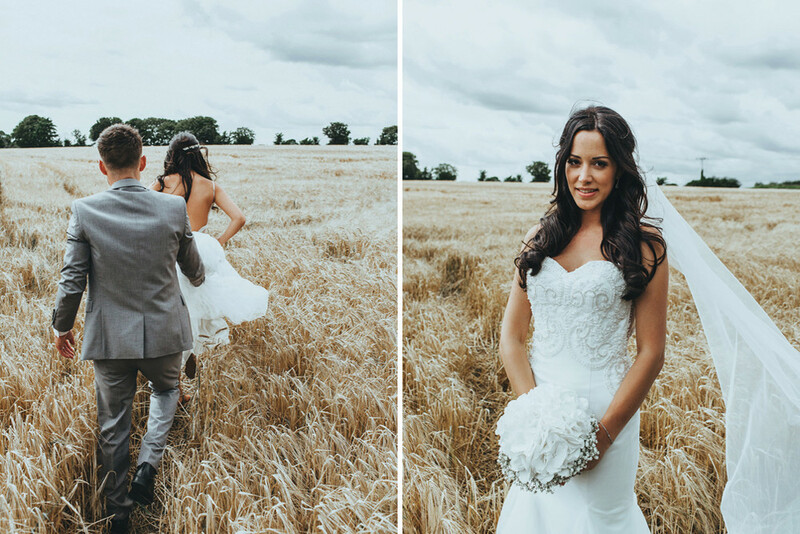 Mine had some added gypsophila to offset from the dress in the photos – such good advice from Maria! 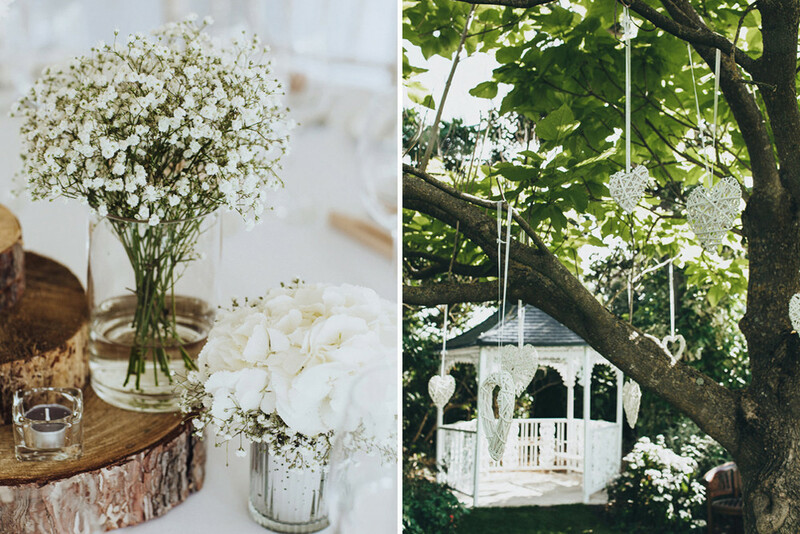 We had a mix of tall centrepieces, large gypsophila balls on silver candle sticks and short centrepieces, clusters of jars with a mix of white hydrangeas and gypsophila. We found the dresses quiet early on in the planning. They were bought from an eBay store again helping keep the costs down! But I loved them as soon as I saw them – they were perfect in colour and were a very simple shape with no fuss. They had a lowish back which was in keeping with my backless dress. We had 2 poems read during the ceremony. Max one of the ushers read the first one. This was a poem which Ben had read in a school assembly at 14 years old when we were first getting to know each other – it was a valentines themed assembly so the poem was about love. Mandi use to sit next to Max in assembly (we have both known Max since the very start of school) so we thought this would be perfect. We had another poem/reading, read by a best friend, Alice. We have both known Alice since the start of secondary school and she has remained a very important part of our lives. The reading was a modern day love themed poem and had some nice funny sections. They both did a great job! We had an evening DJ who was provided with a list of songs from Ben prior to the day. Paul did a great job at selecting these, keeping everyone on the dance floor all night and adding in great choices of his own. We both felt we spent the majority of our evening on the dance floor – just how we wanted! We were privileged to have the best man sing our first dance (a surprise to most of the guests!) – Paul accommodated for this and Daniel was just brilliant! We had heard Merlins food was amazing and they didn’t disappoint! We had a selection of canapés after the ceremony – mini fish and chips etc which we hear went down very well. Ben was keen to have homemade burgers and chips for the main dinner – we added a choice of chicken with dauphinoise as I didn’t want to give my Grandma the only option of a burger 🙂 everyone seemed pleased and we thoroughly enjoyed ours! Mandi’s sister and brother in law made our cake. It was 3 tiered with white buttercream icing – inside was angel cake! It was exactly as we wanted and it looked amazing on the tree slice – totally in keeping with the day. We had a large treat table which we did ourselves – we had lots and lots of sweets in tall jars and large martini glasses – we also had 2 wooden crates of candy floss and a popcorn bar with different choices for toppings! 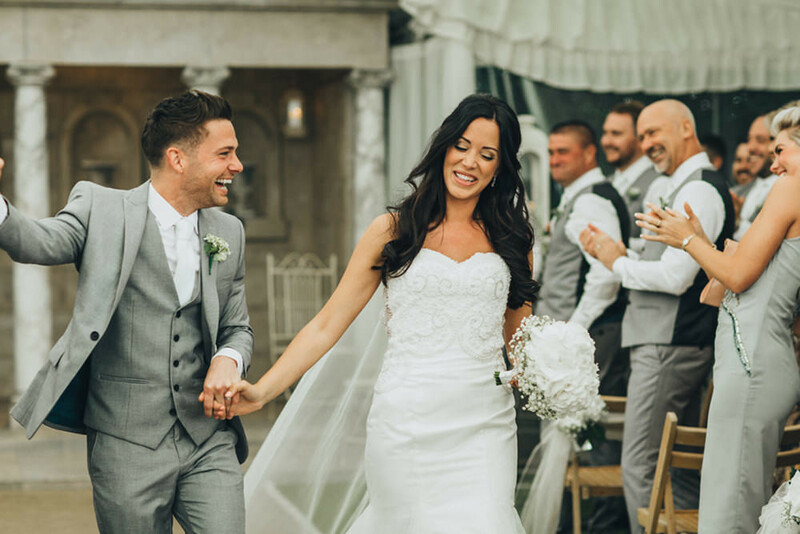 Francesca kindly chose us a winners of her competition which we saw on Rock My Wedding. Unfortunately we had been let down by some local photographers who we had booked further in advance. We met with her prior to the day for a walk around the venue before having some pre wedding photos at Muddeford Quay. 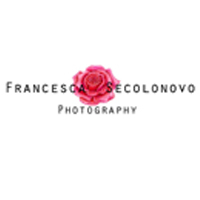 We are not naturals in front of the camera but Francesca took her time with us and made us feel comfortable, guiding us through different shots. We are so grateful to her for all of her time and hard work. As you can see she captures wonderful images which we think will look timeless over the years to come. We didn’t have one of this due to not wanting to overspend – instead many guests collected snip bit videos of the day and we are going to put these into a video ourselves. LOVE letters – as mentioned above, Ben made these with the help of his uncle and a friend – he hand drew the letters on plain sheets of mdf and cut these with a hand jigsaw. He added string bulb lighting so they could be used through the day and into the night. Chalk board style signs – as above Ben also made these. He is very artistic and drew all of them free hand. Tree trunk centrepieces – we were kindly given these and family helped us fixed them in a tiered position. We added wooden arrow hearts with B&M engraved and the wedding date. Hand made table plan – painted frames for each table and hung in a very large wooden frame. We bought the easel and stray painted it grey to match the colour theme. Place names for each guest were scrabble letters glued to wooden racks – we enjoy playing scrabble on the iPad and it was perfect with the wooden theme! We also added a small photo of each person into cork at their place setting. These were drink related – it wasn’t hard to find photos of most of the guest with a drink in their hands! Facebook holds all the best memories. Don’t overspend – the satisfaction once it’s all over knowing that we did so much of it ourselves felt amazing. Love this, was an absolutely perfect day and they both worked so hard. So pleased Francesca picked these two after being let down so close to the day. Great contacts and advice. 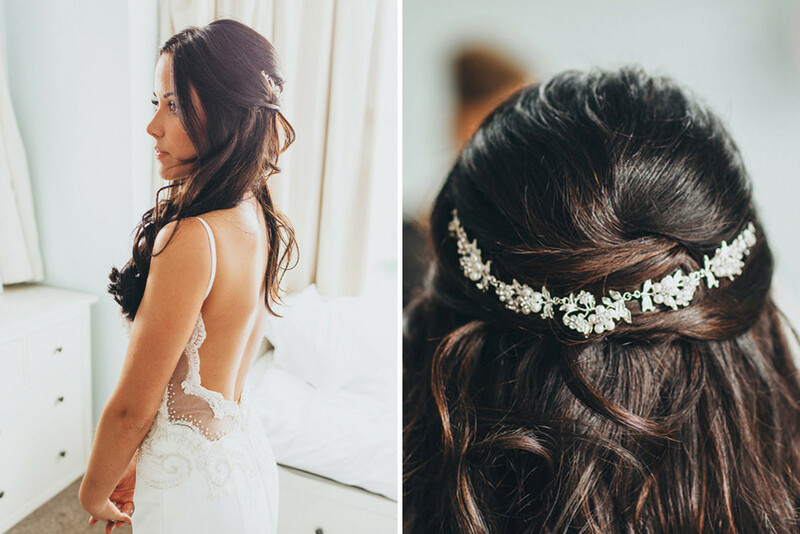 Stunning and classic wedding, love all the homemade touches. I’d be interested to find out the eBay shop for he bridesmaid dresses, if the bride returns. 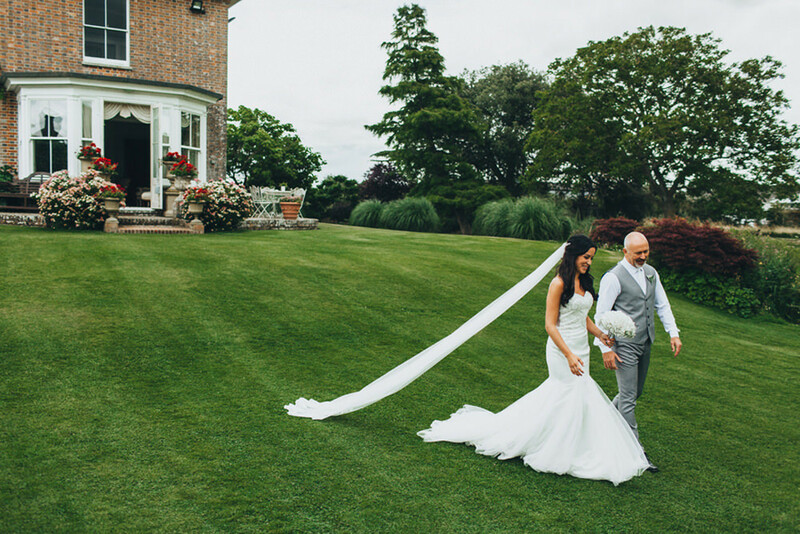 A fabulous, special day and hey what a stunning couple ! ?